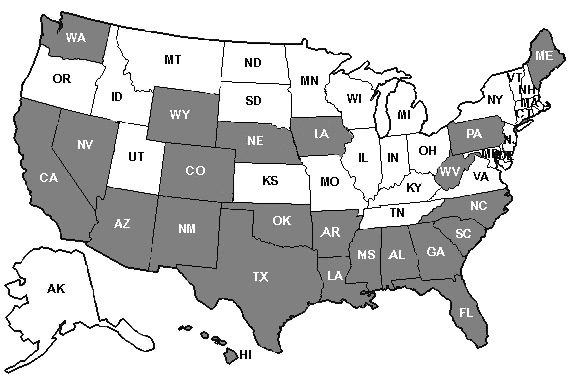 States that have reported golden alga include Alabama, Arizona, Arkansas, California, Florida, Georgia, Hawaii, Louisiana, Maine, Mississippi, Nevada, New Mexico, North Carolina, Oklahoma, Pennsylvania, South Carolina, Texas, Washington, West Virginia and Wyoming. Report Kills - If you see a fish kill or suspect golden alga, contact TPWD's 24-hour communications centers at 512-389-4848 (Austin). Get the Facts - TPWD has collaborated with the Texas Commission on Environmental Quality and other entities to produce a golden alga information card. Download a PDF from the TCEQ website or request a free hard copy from TPWD at hab@tpwd.texas.gov.